The National Prescription Drug Take Back Day addresses a crucial public safety and public health issue. According to a recent National Survey on Drug Use and Health, 6.4 million Americans abused controlled prescription drugs. The study shows that a majority of abused prescription drugs were obtained from family and friends, often from the home medicine cabinet. 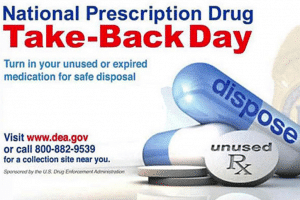 The next Drug Take Back Day is Saturday, April 28th from 10:00 a.m – 2:00 p.m.
Click here for sites near you.